The king in Ancient Egypt, despite his solar nature, was also a human being. After dying, the pharaoh became also a corpse, so a mummy. Therefore it was inevitable to asimilate the dead souvereign with Osiris. And he required also a resurection following the belief of Ancient Egypt. Even Akhenaten needed it. Sarcophagi of Hatshepsut and Amenhotep II. 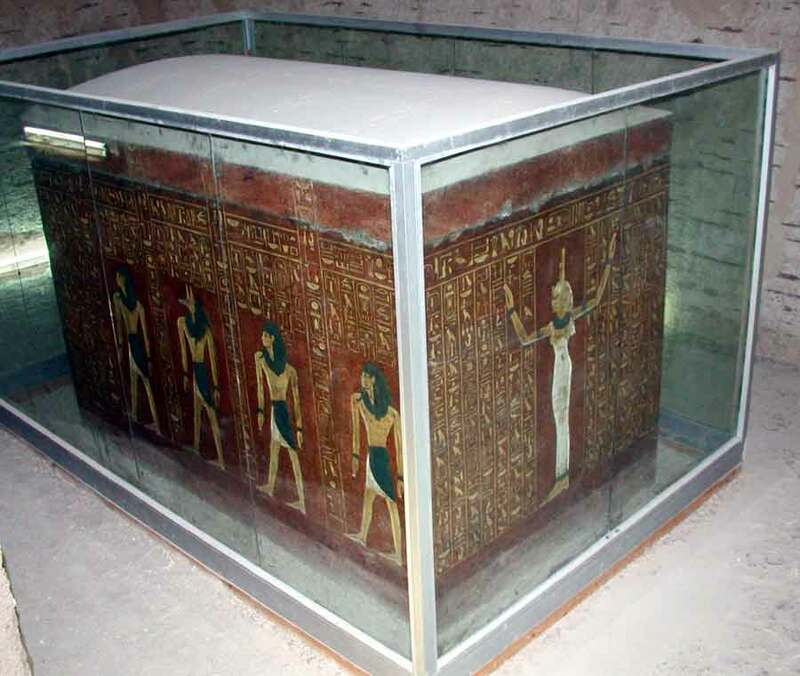 Royal sarcophagi in Ancient Egypt needed also protection for the Pharaoh in the same way particular coffins did. For that reason, Isis and Nephthys, as the mourners of the dead Osiris, were present also at both ends of sarcophagi of kings of the XVIII dynasty. Solar and osirian theologies were complementary in Ancient Egypt. This was not a contradiction, becasue solar and osirian conceptions were complementary in Ancient Egypt. The dead king got into the underworld (the night, the world of Osiris) and made the journey during the darkness as a resurrectional process. In it the role of Isis and Nephthys was essential. After this journey, the dead pharaoh (Osiris) arose to the sky, to the daily light as the resurrected Sun God. But what happenend during the Amarna Period? In this moment of the ancient Egyptian history the Atenism took the place of the official theology. Obviously all the osirian iconography was aswell eliminated from the artistic programm. What happened then with the protection of the royal sarcophagus? The protection of Akhenaten’s sarcophagus was entrusted to Nefertiti. Isis and Nephthys disappeared from both ends of the sarcophagus and the Queen took the role of porotective goddess. She granted the resurrection/protection of the king thanks to her high status and her genre. Sarcophagus of Akhenaten. Nefertiti is depicted at the four corners. Cairo Museum. Photo: Mª Rosa Valdesogo. 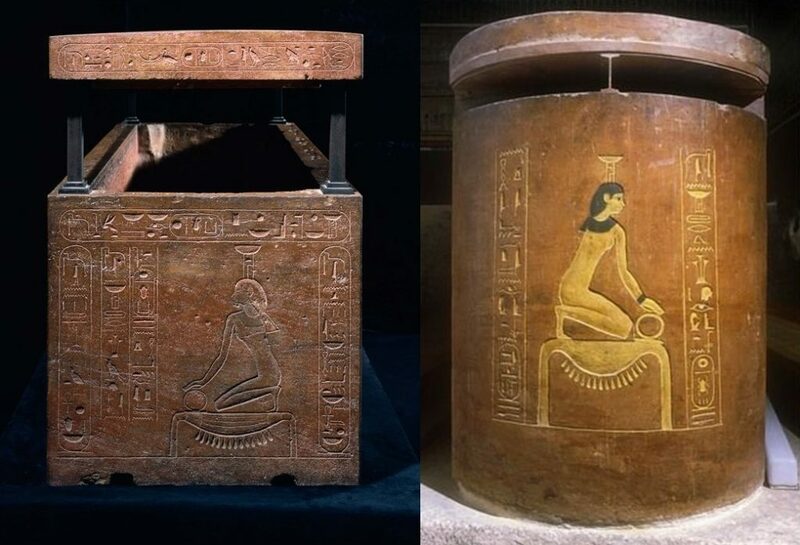 But the ancient egyptian artist of the moment reinterpreted her position on the sarcophagus. Instead of depicting the protective figure (in this case Nefertiti) at both ends of the object, they represented four images of the queen at the four corners of the sarcophagus embracing the corpse of the Pharaoh. “The Lord of everything that He encircles”. “Your rays go around the whole earth”. “Your rays feed all the fields”. The concept is clear, the Aten wrap the whole Earth and thanks to that, everything exists. This concept was moved into the funerary iconography in the figure of Nefertiti. As responsible of the new existence of Akenaten she was depicted at the four corners of the sarcophagus. This way she could cover, embrace and wrap the corpse of Akhenaten and grant his new life.